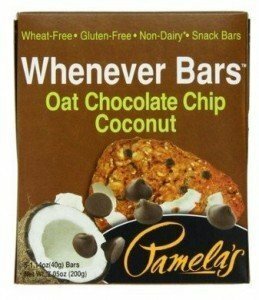 Pamela’s Products is a company devoted to making convenient snacks, cookies and dessert mixes for those with allergy concerns including gluten intolerance. 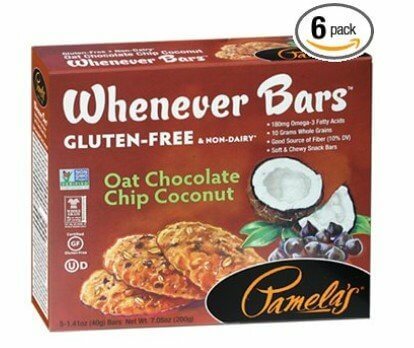 Pamela’s Products Gluten Free Oat Chocolate Chip Coconut Whenever Bars are certified gluten-free by the Gluten-Free Certification Organization (GFCO.com). They are also free of wheat, dairy, and artificial ingredients. These bars are designed to be the perfect snack, light meal, dessert or whenever you need it kind of bar. Each of the 6 boxes contains 5 bars/servings and pack and are sweetened for agave syrup and coconut sugar making them a more health-conscious alternative to bars with lower-quality sweeteners. Rich, organic chocolate chunks made with real organic cane sugar give these wholesome bars an added touch of decadence to make these feel like a real treat without being overly sugary. Their small size makes them a good snack without having huge amounts of calories that are often in meal-replacement style bars and snacks. The health benefits don’t stop there, either. Each bar contains 180 mg of heart-healthy omega-3 fatty acids and 10 grams whole grains and 10% of your daily recommended fiber. Each bar only contains 8 grams of sugar versus the 20+ grams that can be found in many snack and candy bars. These soft, chewy and satisfying bars come in at 180 calories making them the perfect dessert or in between meal snack. Customers really enjoy the attention to allergy information in Pamela’s Products Whenever Bars and the quality ingredients that make them ideal for everyone, not just people with a gluten-intolerance. Fans of the bars often take them for lunch or pack them for travel, outdoor activities and keep them in cars, lockers, desk drawers and any place they might need a quick and convenient snack. Having these Whenever Bars on hand keeps those with allergy-concerns from having to settle for boring snacks or having to take time to make their own baked goods. This might actually be the only negative thing to say about these Whenever bars, that you are likely going to want another one at once!! !